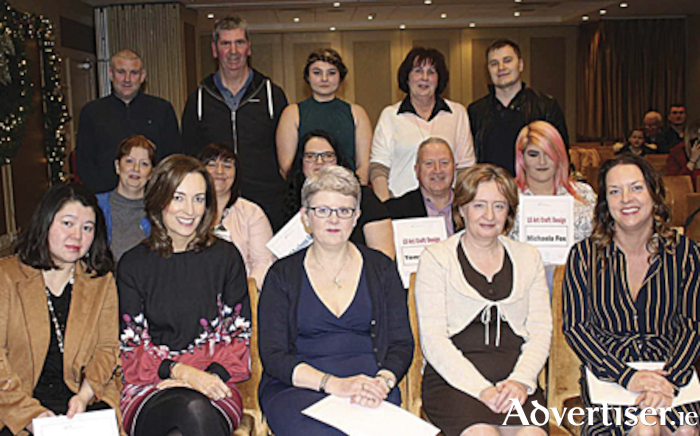 Athlone VTOS students recently graduated at a QQI certificate ceremony which was held in the Shamrock Lodge Hotel. The Athlone VTOS programme is run by the Longford Westmeath Education and Training Board (LWETB ) and is funded by the Department of Education and the European Social Fund. The full time course runs for two years with a wide range of subjects at QQI level five in Business Administration, Software Development and Art and Craft. Athlone VTOS has moved premises and is now situated at Garrycastle at the Athlone Training centre, boasting state of the art student facilities. The certification was provided by QQI at levels four and five and the ICS Skills Foundation provided certification with the ECDL. This certification is very valuable in both providing a path to third level education and also in re-entering the work place. Employers are quick to recognise the potential of students who have been successful in achieving certification from QQI, which incorporates the necessary practical skills which employers require in the workplace today. Several of the past students who attended the night had indeed gained employment since leaving VTOS or had gone on to continue their studies at a higher level at the AIT. Ms. Maria Ryan (VTOS Co-ordinator ) welcomed everyone and congratulated the students on their outstanding achievements. Opportunities for employment were beginning to change with the upturn in the economy recently and VTOS students had armed themselves with new skills and qualifications that are exactly what are needed to gain employment and ultimately help rebuild Ireland. She thanked the staff and tutors at Athlone VTOS and Longford Westmeath ETB for all their help, professionalism and support throughout the year. This year there were 50 certificates - 18 full QQI Level five certificates and 22 component certificates. There were also 15 full ECDL certificates. A huge effort and commitment from students and their families ultimately leads to such awards. QQI (formerly known as FETAC ) is an excellent form of certification which is nationally recognised. Ms. Antonine Healy (Director of Further Education and Training ) congratulated the students and encouraged them to support others who may be considering a return to education. She remarked that each successful student there tonight was the best kind of ambassador for the great service provided by the Longford Westmeath Education and Training Board. Another very welcome guest on the night was Ms. Nicola Galvin who is new to the Longford Westmeath Education and Training Board. She spoke about the amount of time and effort it takes to achieve certification and commended the students on their outstanding achievements. Adult students take the courageous decision to return to education and to take another chance to finally fulfil their true potential. The successful students enjoyed their evening. It was one of celebration and recognition for all their hard work and they went off with the all important ‘piece of parchment’! The Athlone VTOS motto is, “it’s never too late to learn”, and indeed all the successfully graduating students are shining examples of this. Page generated in 0.1170 seconds.